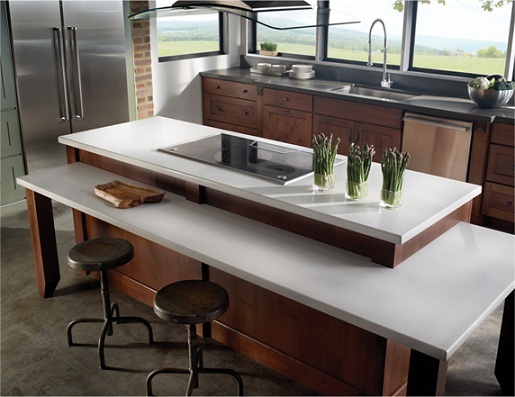 Consisting of 75% recycled content from post-industrial or post-consumer materials and held together by an environmentally friendly corn-oil resin, ECO by Cosentino countertops will keep your kitchen green. Similar to the Vetrazzo Recycled Glass Countertops, ECO is made up of recycled glass and mirror, but also includes porcelain, crystallized ash and stone scraps from regulated quarries under strict stewardship programs. The countertops are produced in an environmentally friendly way as well, with 94% of the water used in manufacturing being recycled, thus minimizing the consumption of a very important resource. All of the minerals used in the production of ECO by Cosentino come from quarries that are fully restored and the manufacturing process is strictly controlled to avoid emissions of any harmful particles into the air. Attempting to raise the bar of green materials, ECO by Cosentiono holds GreenGuard, NSF and Cradle to Cradle Certifications and building teams can gain points toward LEED Certification from the U.S. Green Building Council for a building project with ECO by Cosentino surfacing. 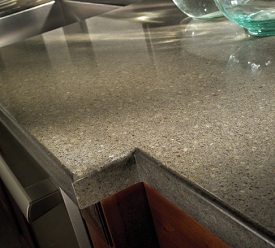 The countertop surfaces perform similar to granite in their ability to withstand heat and scratching, however, they are non-porous, so they do not require any type of sealant. Available in several colors and textures from fine near sold colors, to chunky elaborate patterns, they are unique and beautiful. I have new ECO by Consentino countertops (Starlight) and was told to use something like Simple Green to clean them. Absolutely no Windex or other amonia substances. Any other suggestions? I would recommend other ‘green’ cleaning products that are citrus based and biodegradable such as those put out by seventh generation and Method. How do you like the counters so far?